Josefa Enriquez, a 91-year old resident of George Humphrey Tower, has lived in the building for 16 years. Tenant association president Sherman Rattner speaks to residents at a recent association meeting. “I was forced to move here,” he said from his new apartment in the city's Brickell neighborhood. Vizoso, an 85-year-old Cuban who had lived in the U.S. territory for almost six decades, spent two weeks without power before the second storm created a humanitarian disaster. “The environment created by the hurricanes was very bad,” he said. His son sent him a plane ticket and he spent a few days recovering in a hospital upon arrival. After getting back on his feet, Vizoso checked in on the status of an application he ahd put in two years earlier to come to live in George Humphrey Tower, an affordable housing development for the elderly overlooking the Biscayne Bay in Miami’s Brickell neighborhood. He was lucky. A few days later he had his keys. He didn’t know then it could be a temporary arrangement. By September of 2019, George Humphrey Tower will no longer be subject to Department of Housing and Urban Development, or HUD, affordable housing restrictions. That means the people who live there could be kicked out. Already, the developer who purchased the property in 2014 has signaled that the roughly 400 elderly tenants who call the building home might have to move out at that time. A number of affordable housing developments across South Florida are facing the same situation. According to a February study by non-profit Miami Homes for All, 95 total developments in Miami-Dade County, with nearly 10,000 housing units in total, are at risk of either timing out of restrictions--like what is happening with George Humphrey Tower--or of just being too old to support housing over the next decade. In a region already grappling with an affordable housing crisis, the properties set to time out of affordable regulations will likely deepen the emergency, taking units off the market while cities and counties struggle to build more in the first place. At George Humphrey Tower, the ticking clock looms like an existential cloud over the heads of elderly residents. “I don’t want to even think about getting kicked out, to tell you the truth,” said Josefa Enriquez, a 91-year-old who has lived in the building for 16 years. She pays a rent of $670 per month on her fixed income. When George Humphrey Tower was built, the neighborhood looked nothing like it does now. The bustling luxury strip of Brickell Avenue, resting under the perpetual shade of construction cranes, was then a sleepy hamlet on the bay. At the time the tower was built by the teacher’s union, in 1966, the area was zoned for one-family home per acre of property. On the three acres that make up the property, three homes might have stood. But the Dade County Classroom Teacher’s Association, which later became United Teachers of Dade, had a problem it needed to solve. Just like it is now, affordable housing was a major issue for educators. The union convinced the city to change the zoning, took out a loan from the U.S. Department of Housing and Urban Development and the tower was built to help house aging and retired school teachers. The executive offices of the union were also housed there. Under the terms of the federal loan used to construct the building, the property would be subjected to affordable housing restrictions through 2019. The building was named Stanley Axlrod Tower, after the economic services director of the union, who became the executive director of the tower. Over time, as teachers pay and pensions got better, they made too much money in retirement to be eligible to live in the affordable housing building. In the 2000s, the union started moving to sell the property. It was still managing the building but no teachers were living there, so it was bearing a burden that didn’t help with the union’s intended purpose. Aronowitz said that any money made off of the property would go towards a teacher development fund. The union started negotiating the sale of the property with an unknown buyer for $14 million. Nelson Duque, a local realtor, told the Miami Herald that one of his clients had offered $20 million cash for the property in a way that would stay within federal affordable housing restrictions, but that he never heard back from the union. “We were willing to close in 24 hours, showed proof of funds, and have assets in the same area. We were willing to acknowledge and respect the housing that was needed on site, and we were never answered,” Duque told WLRN. In total his firm made five separate offers to no avail, he said. “If you look at it from a business standpoint it doesn’t make sense. If you look at it from a community standpoint, it doesn’t make sense. If you look at it from a housing needs standpoint, it doesn’t make sense,” said Duque. “Where there’s smoke there’s fire. I just don’t know what they’re burning,” he said. United Teachers of Dade did not respond to requests for comment about the sale. On October 22, 2014, the tower was sold to 1809 Brickell LP, a Florida corporation tied to Brazilian developer Paulo Tavares de Melo. He denies there was anything nefarious about the purchase. “Our company prides itself in doing business ethically and this acquisition was the result of a fully arms-length transaction, following lengthy negotiations with the seller,” de Melo wrote in an email. Real estate blog The Next Miami noted that the $14 million sale was “not close to market value.” One year later, according to county records, the property was appraised at $36,156,775. 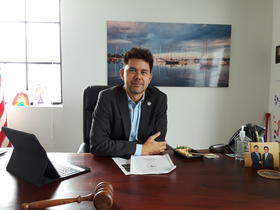 Miami city commissioner Ken Russell has half a dozen elderly housing facilities in his district, which encompasses Coconut Grove, Brickell, downtown Miami and Edgewater. A few times a year he makes visits to those properties, including the one at 1809 Brickell Avenue. “Normally we go there to celebrate Mother’s Day, Valentine’s Day, you know, just go spend some time with some of the folks who maybe don’t have family anymore, maybe they’re a little bit lonely, but we electeds just spend some time,” said Russell. During one of those visits, the building owner and management team held a ceremony to rename the tower to its current name from the former name, Stanley Axlrod Tower, which it bore for over 40 years. “I was at the renaming event and everyone was smiling and shaking hands and I was really wondering what was going on,” said Sherman Rattner, a retired Vietnam veteran who moved into the building in May of 2017. Rattner, a Brooklyn-native of 71, started looking into the situation and became versed in the federal housing restrictions that were about to time out. He was still in the process of moving into the building and was just learning he might have to move again in this lifetime. After poking around the fringes, he decided in May of 2017 to email developer de Melo, who Rattner applauded at the renaming ceremony. Rattner asked about the current status of the building, but, according to a copy of the email he provided to WLRN, was unaware that de Melo already owned the property. Melo’s response shook him. “Our absolute priority is to work together with [building manager and general partner Elderly Housing Development & Operations Corporation], HUD and local officials towards offering as many options as possible to the residents so they are able to relocate after the affordable restrictions expire,” de Melo wrote back. There it was in black and white. Rattner started sharing the information around the building and raising concerns with residents. In February of 2018, the residents of the building voted to start the 1809 Brickell Tenants Association, naming Rattner as President. Members of the association have met with city and county officials about the pending relocation and said they have been trying to set up a meeting with the developer with no luck. At a recent meeting called by the association, the group unveiled a proposal to the developer for how to transform the property into a multi-use building, preserving affordable housing for seniors and current residents. The group presented renderings of what the development, ostensibly called Julia Tuttle Towers, could look like if the association’s vision came to reality. “We are going to pursue every legal right we have with HUD, and every other legal means we can find to protect our rights and to preserve our home,” Rattner told the gathered crowd of about 100. The pitch to the developer is a shot in the dark, “but at least we drew up a proposal and we’re doing something about it,” said Rattner afterward. The tenant association’s calls for local leaders to get involved can only go so far. It’s a matter of national, not local policy. The group has met with Miami Mayor Francis Suarez and the city Department of Community and Economic Development, but say they have not received concrete responses to their concerns. Miami Commissioner Ken Russell represents the building for the city. "We have to remember that this is not a city property and it’s not something that the government can tell a private property owner what to do," he said. Commissioner Russell, who has made affordable housing a major part of his platform, has been following the saga of George Humphrey Tower and was the only elected official who agreed to be interviewed about the issue. “While we do not have a legal responsibility to relocate the residents, we are human and we are compassionate, which is why we are working to find a reasonable solution and continue to collaborate closely with HUD and local officials to identify alternative housing options for the residents." In an email, HUD said that de Melo has until September 1, 2018, to notify residents of his “intentions with the property,” one year before the affordable housing restrictions expire. “Preliminary communications with the residents have begun, but the owner reserves the right to make a final decision until April 2019,” reads the statement. A meeting with de Melo, residents, HUD officials and the building manager, Elderly Housing Development & Operations Corporation, is being scheduled for June 11. “Our offices will be there to understand everything that HUD has planned,” said Russell. In his tenth story apartment, Javier Vizoso spends his days watching episodes of NCIS or Fox News. A Spanish-language translation of the controversial Michael Wolf book about the Trump Administration, "Fire and Fury," lays on the coffee table. Outside the window, he catches glimpses of boats passing by on Biscayne Bay, though the bayside slab of grass has been closed to residents since Hurricane Irma. Sometimes he heads out to nearby restaurants to grab a bite or to catch a game. But it is a home. Residents comment that the waiting list to get into another affordable home could run up to several years in the area. “If they kick us out, we’ll all be on the street, left to our own,” said resident Juan Barrera, who has lived in the building for seven years. Vizoso hasn’t started to sign up for other properties and remains hopeful that some kind of deal will be reached with the developer. After the tenant association met with residents and presented its vision for what could be, Vizoso is hopeful that the group is becoming something formidable. “We have one year and a half to figure this out,” he said.